CAE today reported revenue of $635.5 million for the second quarter of fiscal year 2017 compared with $616.8 million last year. Second quarter net income attributable to equity holders from continuing operations was $48.3 million ($0.18 per share) compared to $75.3 million ($0.28 per share) last year. 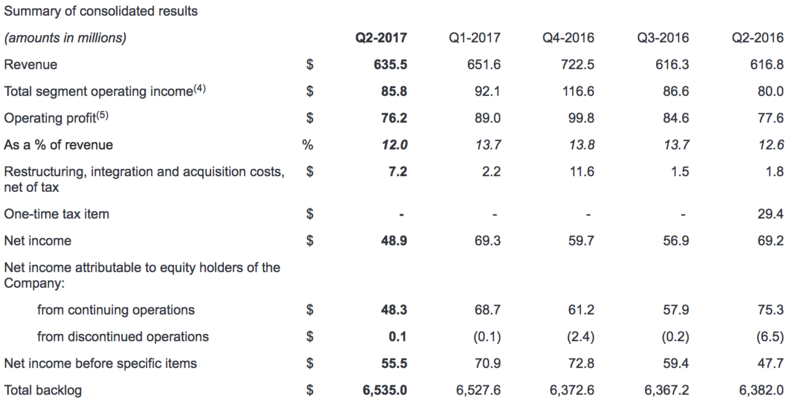 Second quarter net income before specific items(3) was $55.5 million, or $0.21 per share, which on the same basis, compares to $47.7 million ($0.18 per share) last year. "We had good performance in the second quarter and we are tracking our full-year outlook for growth," said Marc Parent, CAE's President and Chief Executive Officer. "I am pleased with our progress in executing our growth strategy in all three of our business segments. Specifically in Civil, we had higher training centre utilization, steady operating income growth, and robust order activity, which highlight our strong position and potential within a large market. Our customers depend on CAE as their training partner of choice and continue to be receptive to our unique solutions. For the Company overall, we received $747 million in orders during the quarter for a new record $6.5 billion backlog." 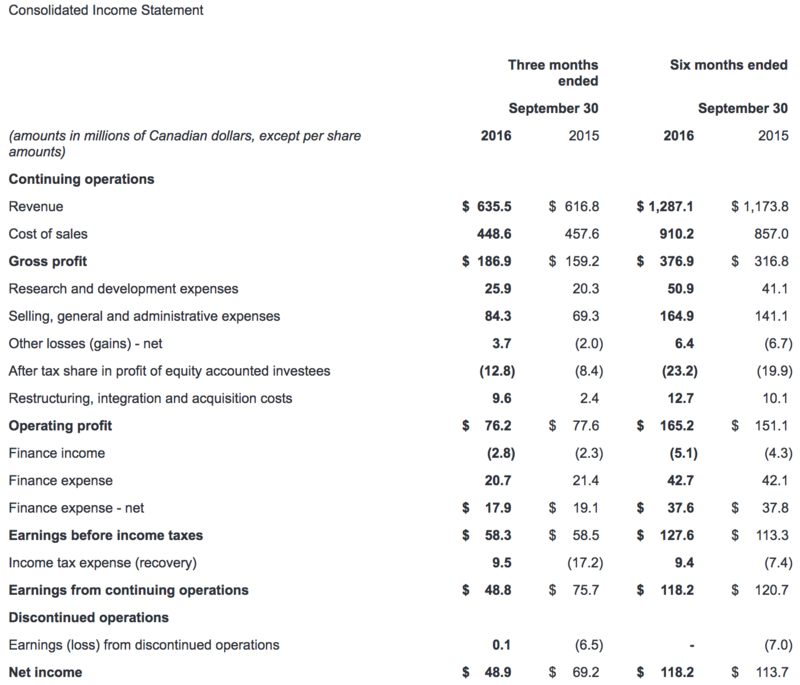 Second quarter Civil revenue was $354.7 million, down 3% compared to the same quarter last year, and segment operating income was $54.2 million (15.3% of revenue), up 8% compared to the second quarter last year. The second quarter includes the impact of a change in revenue recognition arising from the standardization of certain types of commercial aircraft simulators. Civil revenue and segment operating income, if adjusted (6)(7) for the impact of this change would have been $370.0 million and $58.1 million respectively. Second quarter Civil training centre utilization(8) was 70%. The Civil book-to-sales(9) ratio was 1.29x for the quarter and 1.22x for the last 12 months. The Civil backlog at the end of the quarter reached a new record, $3.3 billion. Second quarter Defence revenue was $253.2 million, up 12% compared to the same quarter last year, and segment operating income was $29.0 million (11.5% of revenue), up 2% compared to the second quarter last year. Notable awards in Defence during the quarter included continuing training systems and services support on a range of enduring platforms. These involved the U.S. Air Force for the MQ-1 Predator and MQ-9 Reaper remotely piloted aircraft and the Air Force's KC-135 aerial refueling aircraft. Orders also included the U.S. Navy for training solutions on the MH-60R/S helicopter and the T-44C light transport aircraft. In total, Defence received $261.5 million in orders this quarter, representing a book-to-sales ratio of 1.03x. The ratio for the last 12 months was 0.95x. The Defence backlog at the end of the quarter was $3.2 billion. Second quarter Healthcare revenue was $27.6 million compared to $25.4 million in the same quarter last year, and segment operating income was $2.6 million compared to $1.5 million in the second quarter last year. Notable during the quarter was the use of CAE's solutions in the clinical domain. Healthcare sold its training solutions to a major medical device manufacturer in the U.S., and also began a collaboration with another medical device manufacturer for point-of-care ultrasound training for patient assessment and diagnosis. More recently, CAE Healthcare's Vimedix ultrasound simulator was used as part of the examination process for the European Diploma in Echocardiography for physicians during the European Society of Intensive Care Medicine Annual Congress. Specific items this quarter of $7.2 million (net after-tax) involve restructuring, completed this quarter, related to the process improvement program that we introduced last year, as well as restructuring, integration and acquisition costs related to the purchase of Lockheed Martin Commercial Flight Training (LMCFT). 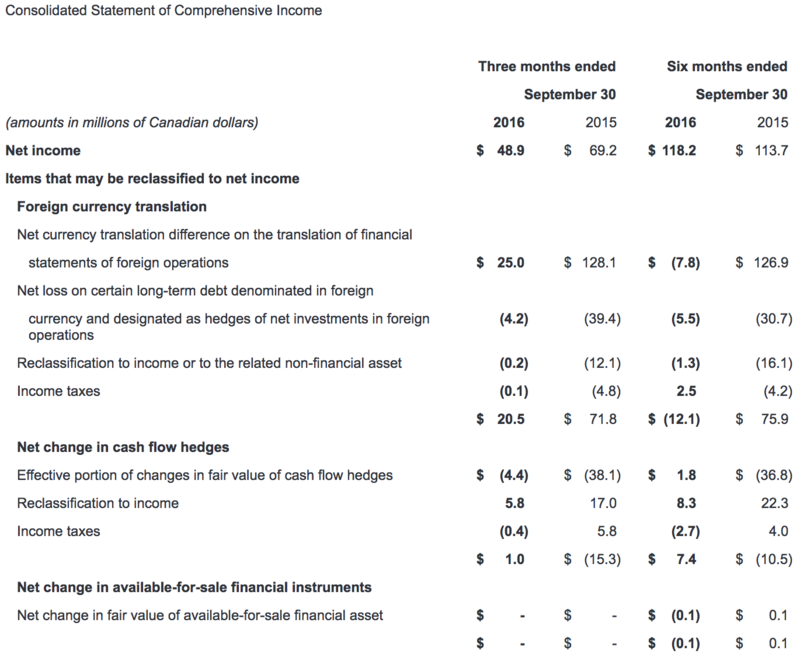 Free cash flow(11) from continuing operations was $27.3 million for the quarter compared to $101.7 million in the second quarter last year. 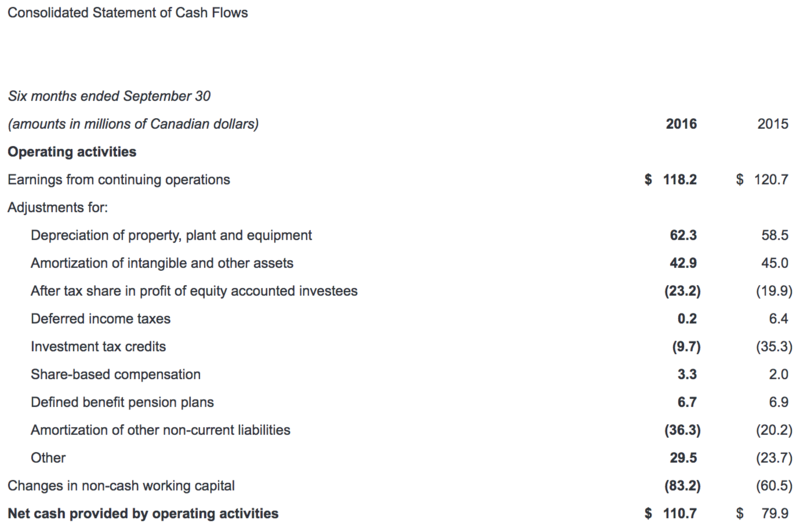 Free cash flow for the first six months of the year was $42.8 million compared to $40.5 million for the same period last year. Income taxes this quarter were $9.5 million, representing an effective tax rate of 16%, compared to 21% for the second quarter last year, excluding one-time tax items. The lower tax rate this quarter was mainly due to a change in the mix of income from various jurisdictions. Growth and maintenance capital expenditures(12) totaled $58.8 million this quarter. 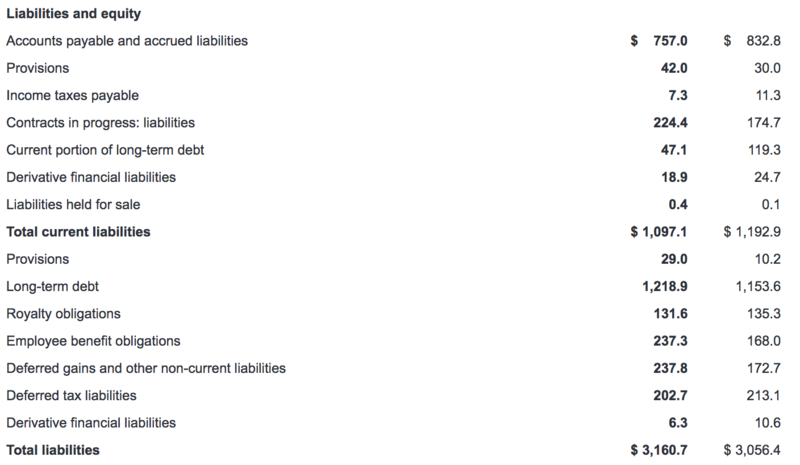 Net debt(13) ended the second quarter at $922.7 million for a net debt-to-total capital ratio(14) of 32.1%. This compares to net debt of $880.3 million and a net debt-to-total capital ratio of 31.6% at the end of the last quarter. Return on capital employed(15) (ROCE) was 10.7% in the second quarter compared to 11.0% last year. CAE will pay a dividend of 8 cents per share effective December 30, 2016 to shareholders of record at the close of business on December 15, 2016. During the three months ended September 30, 2016, CAE repurchased and cancelled a total of 829,100 common shares under the Normal Course Issuer Bid (NCIB), at a weighted average price of $17.20 per common share, for a total consideration of $14.3 million. CAE's process improvement program results in the standardization of certain types of commercial aircraft simulators. 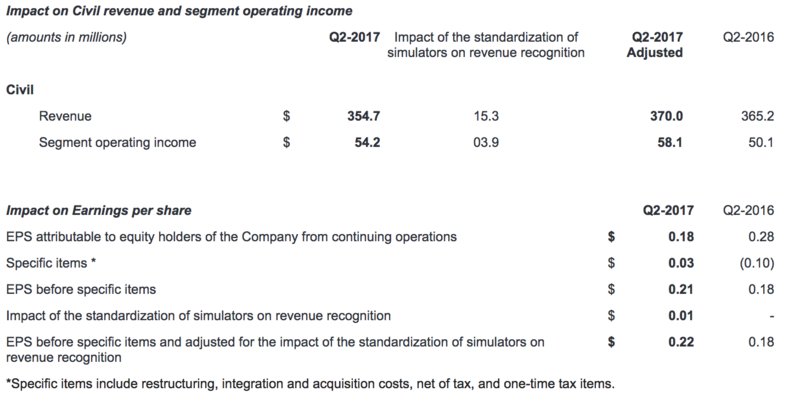 For standardized simulators, percentage-of-completion (POC) accounting is no longer appropriate and thus the Company began recognizing revenue upon completion for such simulators in fiscal 2017. To facilitate performance comparability, management has provided the quarterly impact of this change on Civil revenue (Civil revenue - adjusted(6)), Civil segment operating income (Civil segment operating income - adjusted(7)), and EPS (EPS before specific items and adjusted for the impact of the standardization of simulators on revenue recognition(16)). 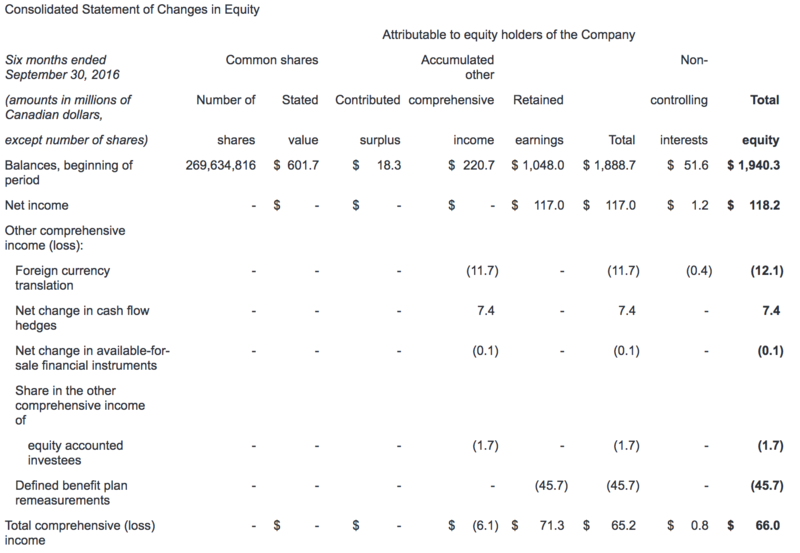 This is a non-GAAP measure. We calculate the impact of the change in revenue recognition arising from the standardization of certain types of simulators by adjusting for the recognition of Civil revenue, Civil segment operating income and EPS upon completion for these simulators versus the Civil revenue, Civil segment operating income and EPS that would have otherwise been recognized under POC accounting. CAE continues to expect revenue and operating income growth in all segments in fiscal year 2017, led primarily by Civil, which is expected to have higher annual utilization of its training network and low double-digit percentage operating income growth. The Company continues to expect modest growth in Defence and double-digit percentage growth in Healthcare. CAE expects the level of total capital expenditures in fiscal 2017 to remain relatively stable with the prior year ($117.8 million), with the exception of the addition of approximately $100 million capital investment for the U.S. Army Fixed-Wing Flight Training program. This program is expected to become operational for training by the end of the fiscal year. Management's expectations are based on the prevailing positive market conditions and customer receptivity to CAE's training solutions as well as material assumptions contained in this press release, quarterly MD&A and in CAE's fiscal year 2016 MD&A. 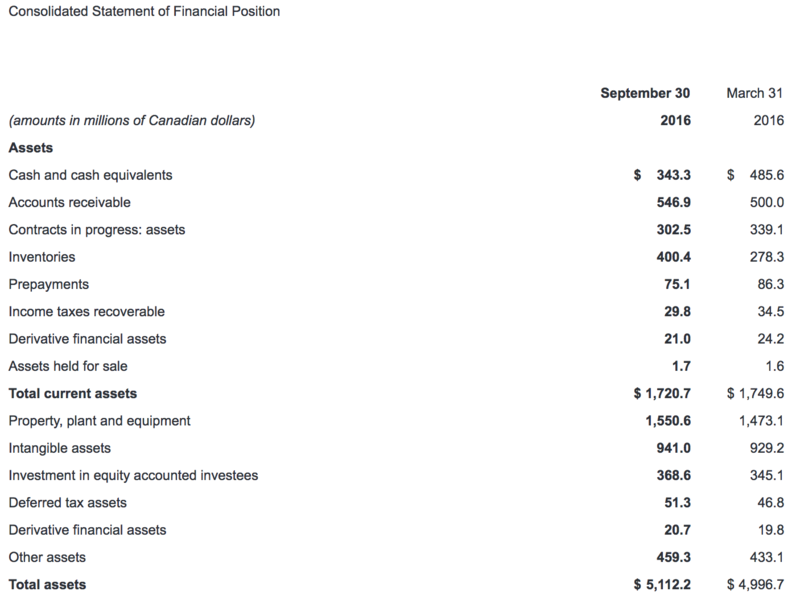 CAE's consolidated interim financial statements and MD&A for the quarter ended September 30, 2016 have been filed with the Canadian Securities Administrators on SEDAR (www.sedar.com) and are available on our website (www.cae.com). They have also been filed with the U.S. Securities and Exchange Commission and are available on their website (www.sec.gov). Certain statements made in this press release are forward-looking statements. These statements include, without limitation, statements relating to our fiscal 2017 financial guidance (including revenues, capital investment and margins) and other statements that are not historical facts. Forward-looking statements are typically identified by future or conditional verbs such as anticipate, believe, expect, and may. All such forward-looking statements are made pursuant to the 'safe harbour' provisions of applicable Canadian securities laws and of the United States Private Securities Litigation Reform Act of 1995. Forward-looking statements, by their very nature, are subject to inherent risks and uncertainties and are based on several assumptions, both general and specific, which give rise to the possibility that actual results or events could differ materially from our expectations expressed in or implied by such forward-looking statements and that our business outlook, objectives, plans and strategic priorities may not be achieved. As a result, we cannot guarantee that any forward-looking statement will materialize and we caution you against relying on any of these forward-looking statements. The forward-looking statements contained in this press release describe our expectations as of November 10, 2016 and, accordingly, are subject to change after such date. Except as may be required by Canadian securities laws, we do not undertake any obligation to update or revise any forward-looking statements contained in this news release, whether as a result of new information, future events or otherwise. Except as otherwise indicated by CAE, forward-looking statements do not reflect the potential impact of any special items or of any dispositions, monetizations, mergers, acquisitions, other business combinations or other transactions that may occur after November 10, 2016. The financial impact of these transactions and special items can be complex and depends on the facts particular to each of them. We therefore cannot describe the expected impact in a meaningful way or in the same way we present known risks affecting our business. Forward-looking statements are presented in this press release for the purpose of assisting investors and others in understanding certain key elements of our expected fiscal 2017 financial results and in obtaining a better understanding of our anticipated operating environment. Readers are cautioned that such information may not be appropriate for other purposes. The value of capital investments expected to be made by CAE in FY2017 assumes that capital investments will be made in accordance with our current annual plan. However, there can be no assurance that such investment levels will be maintained with the result that the value of actual capital investments made by CAE during such period could materially differ from current expectations. The foregoing assumptions, although considered reasonable by CAE on November 10, 2016, may prove to be inaccurate. Accordingly, our actual results could differ materially from our expectations as set forth in this news release. 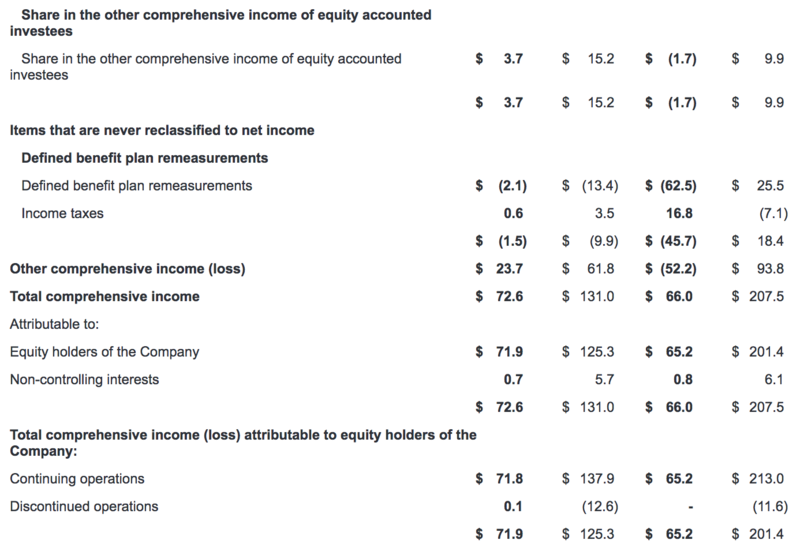 (3) Net income before specific items is a non-GAAP measure we use as an alternate view of our operating results. We calculate it by taking our net income attributable to equity holders of the Company from continuing operations and adding back restructuring, integration and acquisition costs, net of tax, and one-time tax items. We track it because we believe it provides a better indication of our operating performance and makes it easier to compare across reporting periods. (6) Civil revenue - adjusted is a non-GAAP measure we present to facilitate performance comparability that takes into account the impact of the change in revenue recognition arising from the standardization of certain types of simulators. We calculate this by taking our Civil revenue and adjusting for the impact of the recognition of revenue upon completion for these simulators versus the revenue that would have otherwise been recognized under POC accounting. (7) Civil segment operating income - adjusted is a non-GAAP measure we present to facilitate performance comparability that takes into account the impact of the change in revenue recognition arising from the standardization of certain types of simulators. We calculate this by taking our Civil segment operating income and adjusting for the impact of the recognition of segment operating income upon completion for these simulators versus the segment operating income that would have otherwise been recognized under POC accounting. (8) Utilization rate is an operating measure we use to assess the performance of our Civil simulator training network. We calculate it by taking the number of training hours sold on our simulators during the period divided by the practical training capacity available for the same period. (11) Free cash flow is a non-GAAP measure that shows us how much cash we have available to invest in growth opportunities, repay debt and meet ongoing financial obligations. We use it as an indicator of our financial strength and liquidity. We calculate it by taking the net cash generated by our continuing operating activities, subtracting maintenance capital expenditures, investment in other assets not related to growth and dividends paid and adding proceeds from the disposal of property, plant and equipment, dividends received from equity accounted investees and proceeds, net of payments, from equity accounted investees. 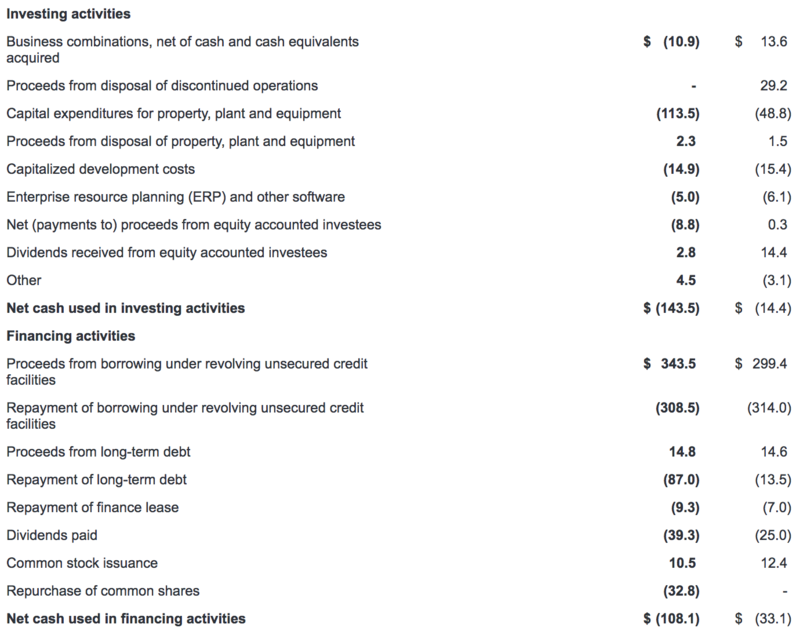 (13)) Net debt is a non-GAAP measure we use to monitor how much debt we have after taking into account liquid assets such as cash and cash equivalents. We use it as an indicator of our overall financial position, and calculate it by taking our total long-term debt, including the current portion of long-term debt, and subtracting cash and cash equivalents. (16) EPS before specific items and adjusted for the impact of the standardization of simulators on revenue recognition is a non-GAAP measure calculated by excluding the effect of restructuring, integration and acquisition costs, one-time tax items and the impact of the standardization of certain types of simulators from the diluted earnings per share from continuing operations attributable to equity holders of the Company. 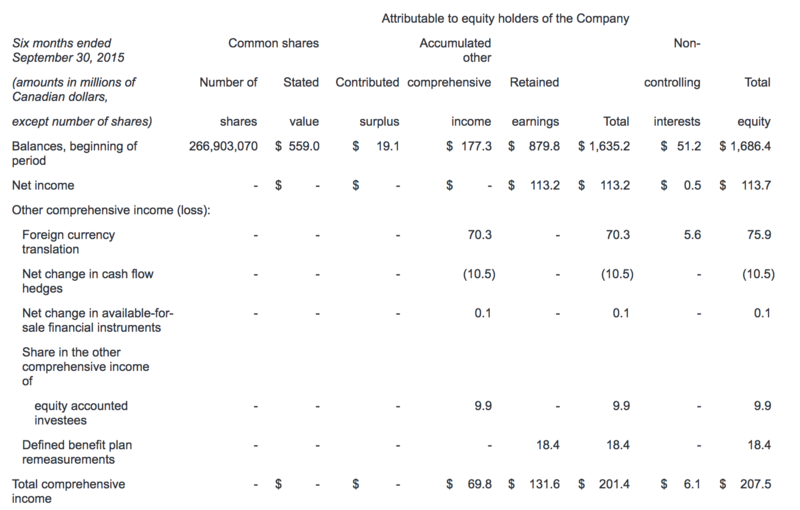 The effect per share is obtained by dividing restructuring, integration and acquisition costs, net of tax, one-time tax items as well as the impact of the recognition of net income upon completion for these simulators versus the net income that would have otherwise been recognized under POC accounting by the average number of diluted shares. We track it because we believe it makes it easier to compare across reporting periods.